Using the latest technology, our expert teams can install and replace water pipes with minimal disruption to supply. The lifespan of a water main depends on many factors including pipe material, ground conditions, age and year of manufacture of the pipe, traffic loading on the ground above, the working pressure inside the main, even the source and nature of the water the pipe is carrying. What was a suitable location for a water main when it was installed may no longer be appropriate. 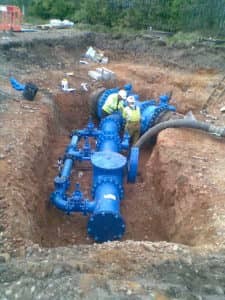 Alterations may require a new water supply or a diversion to the existing main whilst increasing demand as a business or community grows may require a larger diameter pipe tbe installed. 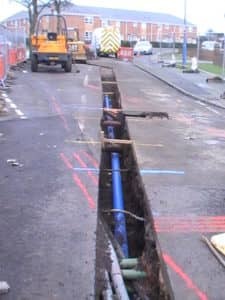 We provide a cost effective solution to all water mains replacement or rehabilitation projects including design, project management, installation, maintenance and rehabilitation of all types and sizes of water mains. Under Pressure connections available including Linestopping and Valve Insertion.